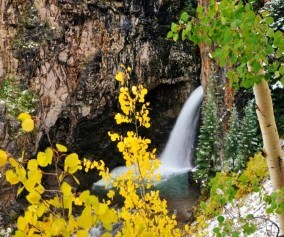 The Tarryall Falls Trail is a short, 1/4 -mile hike across a small canyon to a waterfall that pours into Tarryall Creek. 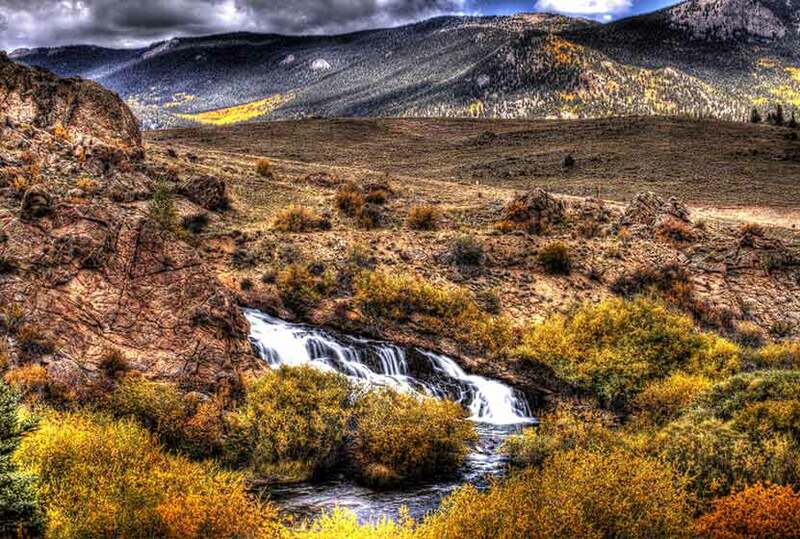 The slopes of snow-capped peaks along Boreas pass make for a majestic backdrop against the contrasting sage grasslands of surrounding South Park.Tarryall Falls draws its waters from the Tarryall Reservoir, a popular camping and fishing destination here in the high-plains. 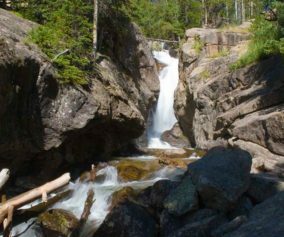 Explore the full Tarryall Falls hike profile below for trail map, driving directions, and more tips and details to help you enjoy this adventure near Jefferson, Colorado. From Denver, take HWY 285 South to Jefferson. In Jefferson, turn left onto CR77 and continue for about 17 miles. The parking pullout is on the southern tip of the reservoir on the right-hand side of the road. This is about 1hr 45 min drive. From Colorado Springs, take US 24 toward Divide. At 5.4 miles west of Florissant turn right to Tarryall Road / CR 77. Continue on CR 77 for about 24 miles. This stretch makes for a beautiful drive, especially just before sunset when the Tarryalls are lit up all pink and orange. Just after mile 24, there will be a pullout parking area on the left side of the road alongside the reservoir. The hike description below begins at this parking area. 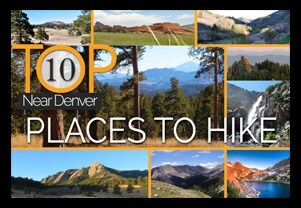 This is about a 1hr 30 min drive from Colorado Springs. The roadside viewing area is easily accessed by turning on to Turner Gulch Road. The parking area is located on the right-hand side of the road soon after turning onto Turner Gulch road. 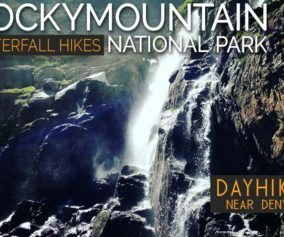 It’s less than a 1/4 mile jaunt from the parking area to the waterfall, but be aware that the trail winds through some rocky and loose terrain on this unmaintained trail. The trail begins on the gravel path that heads down toward the reservoir then descends to a footbridge spanning Potato Gulch, a small canyon that serves as an overflow from the reservoir back into Tarryall Creek. I’ve marked the trail on the map above, but this is intended for general reference only. Take care as you navigate the trail as it winds through the rock on the other side of the footbridge. The path will lead to the top of the waterfall, then eventually down to the base of the falls. This area is not recommended for pets or children and if present should be supervised. As mentioned in the driving directions above, the stretch of road between Tarryall Reservoir and Lake George is one of my favorites for sunsets. 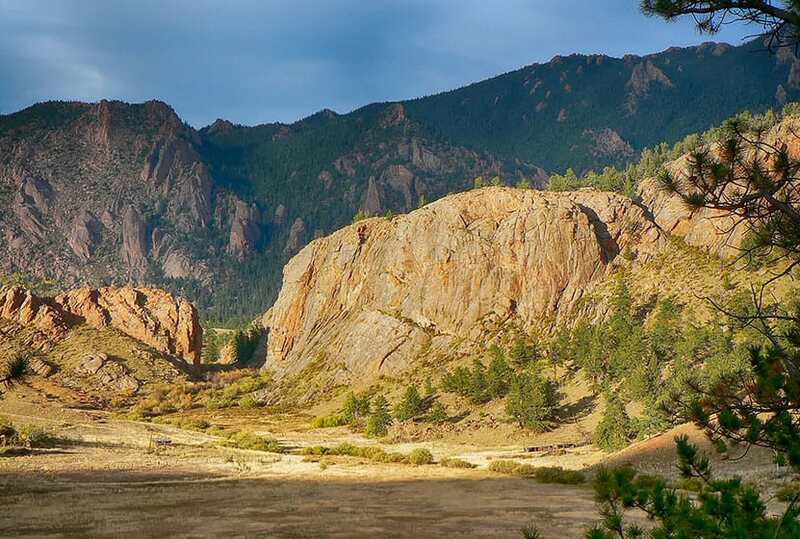 Like the Flatirons of Boulder, the Tarryalls have a pink and orange hue but showcase deeper reds, especially at dusk. When the sunlight hits the rock, the mountains seem to come alive. 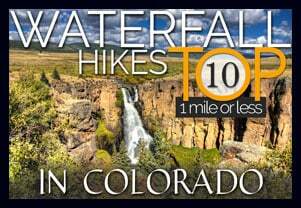 Hikers coming from Denver can make a day of it by first visiting the trails along Kenosha Pass, then driving to Tarryall Falls. From there, drive South on CR77 to Lake George, taking in the Tarryall Mountains until you come back out to HWY 24. 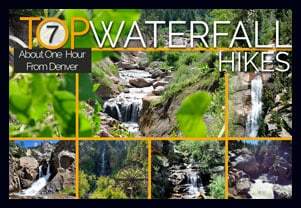 Follow Highway 24 South to visit Rainbow Falls in Manitou Springs. 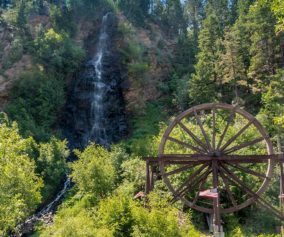 Grab a bite to eat in Manitou or Colorado Springs, then stop by and visitHelen Hunt Falls. 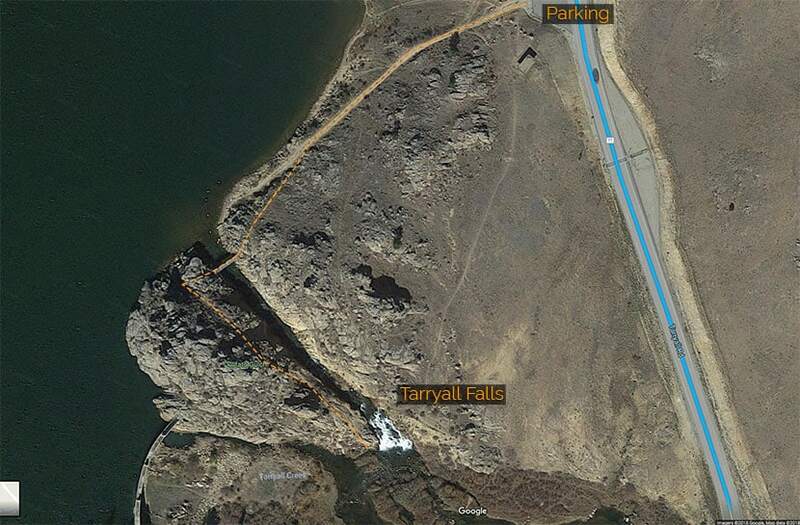 All three waterfalls in this driving loop require very little hiking. Finally, take Interstate 25 North back to the Denver area. TIP: Exercise care on this short trail as it is not an officially established or maintained trail. Photo: We would like to express our gratitude to Michael Roberson and Christopher Rosenberg for sharing such an amazing photographs of Tarryall Falls and nearby mountains. After the Hike: The Shaggy Sheep in Grant, Colorado.